A citizen advocacy group denounces advertisements in the race for Supreme Court, and demands an investigation. 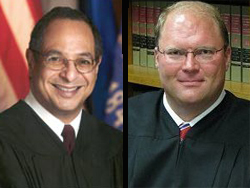 Citizen Action of Wisconsin is calling on the Wisconsin Judicial Commission to investigate Supreme Court candidate Mike Gableman &apos;s campaign for violating the Code of Judicial Conduct. "We believe that the latest ad by Judge Gableman in the Supreme Court race actually violates the Judicial Code of Ethics in several important ways." Robert Kraig, Director of Program for the 90-thousand member statewide group, says the Gableman campaign uses the attack ad (against Justice Louis Butler ) to mislead and confuse the public. Kraig says if Gableman would do such a thing merely for political gain, imagine what the judge would do on the bench. "The Judicial Code of Ethics says that you cannot make false statements about other candidates for court, and we believe that happened in the case; and you also can&apos;t deliberately cause public confusion about the judiciary, you have the legal system. And we believe the ad does that as well." The public is used to attack ads containing misleading information, but Kraig says judges are different. "The reason for the Judicial code of conduct in the first place is that judges – especially supreme court justices – need to be held to a higher standard." Kraig says there&apos;s also a disturbing racial overtone to the ad, reminiscent of the Willie Horton ad during the 1988 presidential race at which time George Bush Senior used an ad to depict his opponent Governor Michael Dukakis as soft on crime. Gableman&apos;s campaign defends the ad. NOTE: On Monday, the Wisconsin Judicial Campaign Integrity Committee had urged that the ad be taken off the air.